Bok choy is a delicious vegetable with a dense crunchy bulb at the base and tender greens on top. When cooked, bok choy has a mild, slightly sweet flavor that shines in Asian dishes. Our bok choy, grown hydroponically, still has its small roots at the base so that it will last longer and stay crisp. Baywater Farms grows multiple varieties of kale including red kale and toscano kale. Kale is packed with health benefits and its leaves can be used in salads, smoothies, or any place that you would use other specialty lettuces. You can use kale in its raw form or cook it like you would spinach, removing the tough rib areas before cooking. Our frisee lettuces are available in multiple colors including bright green and a gorgeous red. Frisee has a curly and shaggy appearance and a slightly bitter taste. The mild flavor of this lettuce, part of the endive family, is the perfect base for rich salads with egg, bacon, blue cheese, and apples. Baywater Farms romaine includes traditional bright green romaine and other varieties, like red romaine. Our romaine has a mild flavor, bright crunch, and deep green color. Hydroponically grown romaine lettuces are consistent in size with sturdy white ribs that can be used as wraps or a crispy base for a salad. Because our romaine lettuces are hydroponically grown, they come with the roots still attached so that every head will stay fresher for longer. 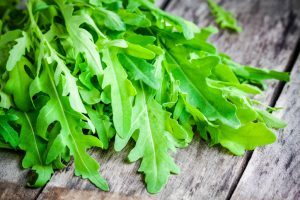 Arugula, also known as rocket, is a gorgeous green leafy lettuce with a peppery flavor. Arugula’s small leaves are ideal for tossing in a salad, topping a pizza, or adding to a savory sandwich or wrap. Whether in our hydroponic greenhouse or our surrounding fields, we can tackle custom grows for any restaurant or wholesale heirloom produce distribution company. If the lettuce blend or specialty lettuce you are looking for isn’t listed above, contact us to see if it’s in season or arrange a custom grow for your needs. Baywater Farms specialty lettuces are delivered fresh from our farm to your restaurant or produce distributor. They are ready to wash and use, store whole, or wash and chill. All of our hydroponically grown specialty lettuces are given to the end consumer with the roots still attached to ensure the maximum shelf life possible. Baywater Farms is committed to high-quality hydroponic produce grown with care on our sixth-generation family farm. All of our specialty lettuces are planted, harvested, and sent to you with great care and love. In our ½ acre greenhouse, we grow 24 acres’ worth of delicious, fresh Maryland produce using sustainable methods. Since our greenhouse is climate-controlled and carefully tended to, our hydroponically-grown lettuces, herbs, and microgreens are available throughout the year. Every one of our sustainably grown hydroponics is constantly being grown and harvested, so our produce can go from our farm to your table in hours, not weeks. You can find our fresh hydroponic specialty lettuces including bok choy and toscano kale, in national grocery store chains, local farm-to-table restaurants, produce distribution companies, roadside farm stands, CSAs, and farmers’ markets. To learn more about our innovative cold-chain process and ordering our fresh local produce, click here. Our hydroponics speak for themselves, and we know your taste buds will love to listen!